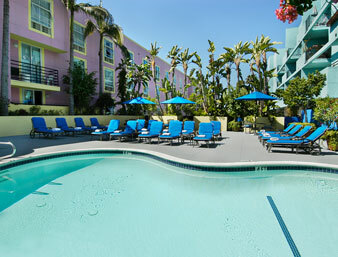 Ramada Plaza Hotel West Hollywood is a premier style hotel located on Santa Monica Blvd, and within radius of notable entertainment spots in Hollywood. The hotel’s location off Route 101 and Interstate 405 on the vivacious Santa Monica Blvd makes this an accessible location to simply kick back and enjoy the finest trappings in this entertainment hub. To get to the hotel, you can use this address: 8585 Santa Monica Blvd, West Hollywood, California 90069, USA. West Hollywood, commonly referred to as WeHo, is home to fascinating attractions that keep visitors coming all year round. The Petersen Automotive Museum for instance, showcases a range of automobiles, ranging from classic models to futuristic cars that allow glimpses into the automobile industry. Hollywood Bowl on the other hand, brings together your favorite stars for live music and the best of star-studded performances. The Greystone Mansion is a fascinating location for self-guided tours of the expansive houses straddled over the grounds. The mansions have been a choice film location, so get to relive these moments in your own way. Other nearby attractions include theme rides at the Universal Studios Hollywood, movies at the TCL Chinese Theatre and hiking at Griffith Park. Ramada Plaza Hotel West Hollywood has a host of facilities designed to ensure that you have the most memorable vacation. Enjoy a host of services at the business centre, regardless of whether you would like to have a conference call, hold meetings or simply send mail. With ATM and phone services at hand, you will still be able to catch up with your day’s business. What is an excellent vacation without fine dining? Treat your palate to a unique culinary experience by indulging at the swanky American Restaurant that operates 24 hours. Or simply grab a tantalizing burger at Burger Joint. Top this off with a workout at the equipped fitness centre, or head to the magnificent outdoor pool should you opt for a cooling dip. Whether you want to catch up with your favorite movies on the flat screen TVs, or prefer to surf the Web for the latest shopping deals, Ramada Plaza Hotel WeHo is the place to be. Relax away using quality products at Body Factory before hiring the services of Enterprise Car Rental to enjoy attractions in this part of Hollywood. Paid parking is available too, ensuring you have peace of mind during your vacation. Room options exist for different preferences that visitors have. Choose between the Bedroom suites and executive suites depending on what best meets your needs. Check-in time is 1500 hours and visitors are expected to check out by 1200 hours. Rates provided will vary depending on the date reservations are made. Ramada Plaza Hotel West Hollywood is a 3-star hotel that gives you value for your money, and memories that will be etched in your mind forever. Its nearness to fascinating attractions is the more reason why you should spend time at this amazing hotel the next time you are in WeHo.